The undead are marching. Arth's markets are crumbling. All hope is fading. It’s going to take one bone-rattling adventure to fix things. Chaos breeds business, and business is good in Arth. WMost Noncombatant Paper Carriers, or NPCs, have been forced out of the major cities, the Shadowkin in the Red Horde are raiding villages throughout the Freedlands, and an undead army is rising in the east. With potential F.O.E.s in every direction, the heroics industry is booming and the businessmen are happy. When the greatest threat Arth has seen in an age emerges, fueled by dark magic and direct marketing, Andarun's elite focus on their profit margins. When markets start collapsing, political and business leaders start dying, and cities fall only to rise again, it seems as though the gods have abandoned the people of Arth. 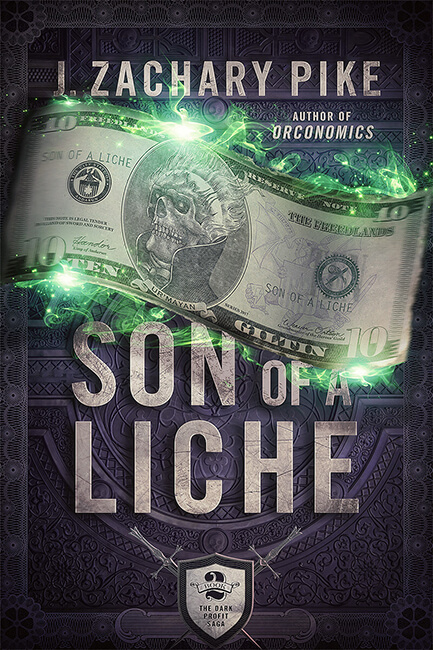 Can Gorm Ingerson and his fellow Heroes of Destiny overcome corrupt corporations, crooked politicians, ancient magics, angry Orcs, nefarious artifacts, and the risen dead to change the face of Arth—and how it does business—forever? Copyright © 2016, Gnomish Press LLC. All rights reserved. Some illustrations on this page by Nikolas Hagialas.